Charity work done by Retina Ophthalmological Outpatient Clinic and Hospital. In November 2016, together with our patients – children and adults, we had a charity collection for people in need from developing countries. 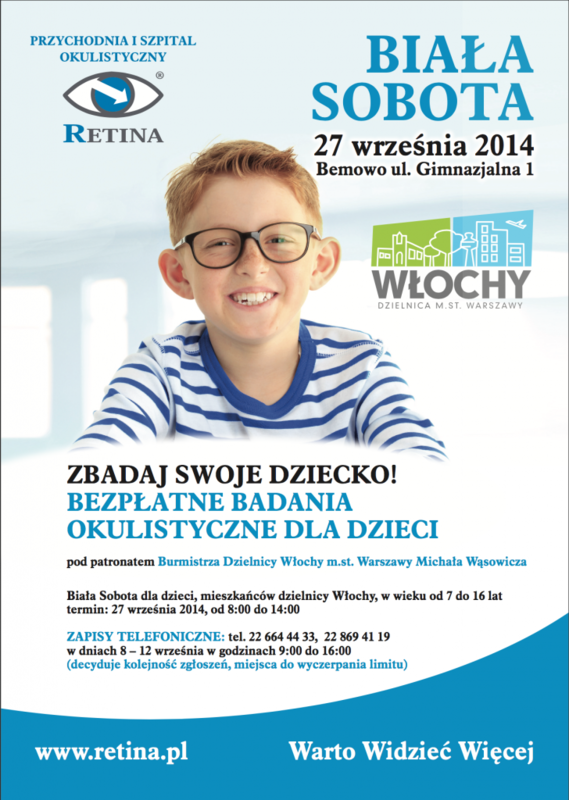 Our action “Give a gift of glasses” was organized in cooperation with a secondary school in Racibórz. In the end we collected 205 pairs of glasses for children and adults. We would like to thank everyone who decided to support this action! We count on you in future events, too! Culture of support – those words are familiar not only to our medical staff, but also to our patients. Our clinic takes part in different charity events. This direct involvement gives us a lot of satisfaction – especially if we receive feedback from people we aim our help at. Everyday duties aside, our staff gets involved in varied social initiatives. As far as social issues are concerned – child poverty, low social status of certain people and groups, mistreated animals – Retina has always seen practical actions in these fields as a vital part of our contribution to the promotion of health. For many years we’ve been sponsoring a speckled pidgeon in the ZOO in Warsaw. He is our company’s Dr Mietek.